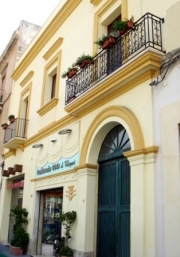 The apartments are located in a very central part of Trapani, only a few steps from the sea, from the train station, old town and the shops. Right in the center of the country on the way Fardella, allow to reach, two steps, the most prestigious shops, restaurants, churches of the old town and the beach of the coast. Starting point for excursions to the city center and for bathing beaches, to visit the tourist attractions - cultural area (Selinunte, Segesta, Erice, San Vito lo Capo) reachable in about 20 minutes by car.